Jeffery Camp (b. 1923) is one of Britain’s most accomplished artists. In this unique book Camp brings together his highly individual figure compositions with comments on art and life. Tender studies of figures, plants, and birds, paintings of the sea and shore, and portraits of artist friends and contemporaries reveal his astonishing draftsmanship. Pithy and astute observations are interspersed with the works, from notes on the tools and techniques of his trade to reflections on his artistic influences and the passing of time. 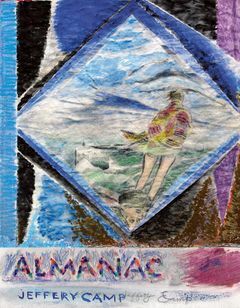 Following Camp’s acclaimed books Draw: How to Master the Art and Paint, which offered insights into ways of working and looking, Almanac adds an autobiographical element to showcase the full extent of the artist’s considerable talent. Jeffery Camp is a prize-winning artist whose paintings are widely exhibited and can be found in many collections, including those of the Royal Academy of Arts, Tate, and the Arts Council of Great Britain.